The new focus on eliminating 'friction' in the process by providing a holistic, tech-driven 'solution' is designed to address the frustration with cost and time of those in the market as home buyers or sellers. One of the most inconvenient aspects of buying a new home—and offloading the old one—is lining up move-out and move-in dates. Typically, people need to sell their old place before buying the new one because they simply need the money from their existing home to pay for the new one. But doing so can result in a gap between moving dates, requiring temporary housing. In the last five years, multiple venture capital-funded tech startups—the most notable of which are Opendoor and Offerpad—have launched with the goal of solving this pain point in the homebuying process. The companies then clean and fix up your old house and sell it on the open market, collecting a fee from the seller. And because the price at which iBuyers buy the house is usually not the maximum the house would fetch if it was sold traditionally, they likely make a small gain on the sale price. iBuyers resist being labeled “home flippers” because of the negative connotation (the practice has been shown to diminish cities’ affordable housing stock). And as real estate consultant Victor Lund notes, the service iBuyers provide boils down to a financing instrument. 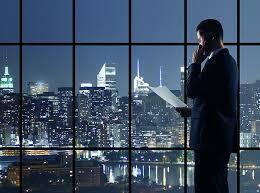 The companies essentially extend a line of credit to a homebuyer using the existing property as the collateral. Customers then use that line of credit to buy a home. The key difference is that iBuyers don’t collect on the loan through monthly mortgage payments or by selling the loan. Instead, they collect on the loan after the move-out by liquidating the collateral—the old house—for more than they paid for it. Other startups have popped up with their own spin on the process. Atlanta-based Knock, for example, buys you a new house and then sells your old house on the open market. They call it a trade-in program. This allows a seller to let homebuyers bid up the price of the home like they usually would and thus collect the full value on their existing house; Opendoor’s and Offerpad’s offers typically represent a minor discount on the house’s full, open-market value. Charlotte-based startup Ribbon also buys your new home for you, and you can move in and pay rent until your old house sells. As the concept becomes more mainstream, more variations on iBuying are likely to follow. A drop in the real estate ocean, but is the tide turning? With glossy marketing, aggressive PR campaigns, and billions in VC cash to burn, iBuyers have been expanding steadily. Since launching in 2014, Opendoor has spread to 20 major real estate markets in the United States. Offerpad entered its 13th and 14th markets—San Antonio and Austin—just this week. 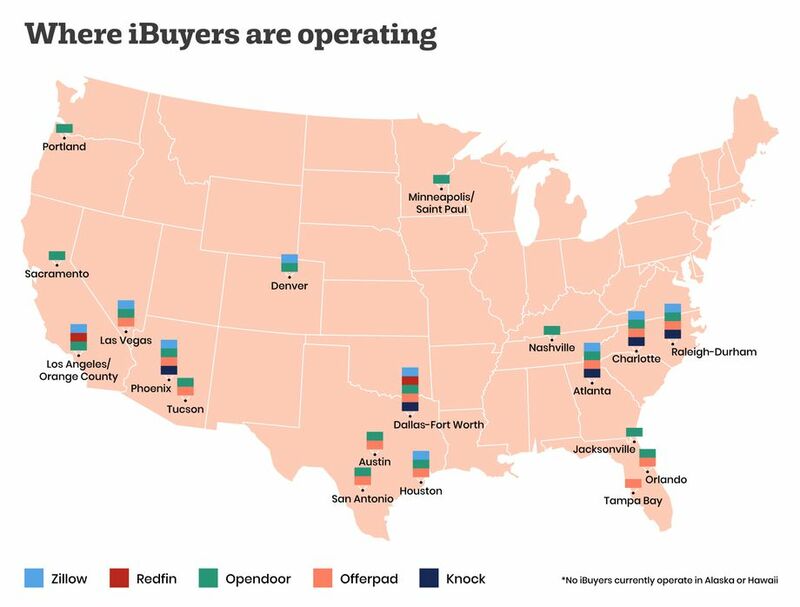 Still, iBuyer transactions currently represent a tiny fraction of all home sales; Curbed sources estimated that roughly 5 percent of sales in the markets where they operate were completed through iBuyers. Opendoor, the largest of the iBuyer companies, flipped 10,130 homes in 2018, according to ATTOM Data Solutions, a real estate data provider. There were 5.3 million existing home sales in 2018 and 622,000 new home sales. Traditional realtors have, of course, started fielding questions from home sellers wanting to know more about Opendoor and Offerpad. Traditional realtors argue that going through iBuyers risks leaving a significant amount of money on the table, compared to letting potential buyers bid up the price through realtors. Moreover, the half-decade-old iBuyer business model has not yet had a chance to prove that it can weather a shift in the housing market, much less a downturn, as home prices and sales have steadily risen with an economy rebounding since the2008 financial crisis. But that may be changing. Since the summer of 2018, home price appreciation has slowed dramatically, particularly on the West Coast, and home sales—both new and existing—have tumbled along with it. With wages rising considerably slower than home prices over the last 10 years, the latter appears to have plateaued. That’s a problem if your business model is selling homes for slightly more than you paid for them. Even just shifts in the housing market could pose a challenge for iBuyers. The value of iBuyers is in expediting the home sale process. If the average number of days homes stay on the market shrinks considerably, there’s less need for an expedited sale. Conversely, if homes start taking longer to sell, iBuyers have to hold onto houses longer, and that results in more they have to pay in taxes, homeowners association fees, and other holding costs. Despite their relatively small operating volume and the uncertainty around their business model, iBuyers have raised so much money and attracted enough attention that some of the biggest players in real estate have begun feeling compelled or forced to follow suit. Listings giant Zillow launched a home-flipping service called Zillow Offers in April 2018, and Redfin began testing Redfin Now in June 2017. Zillow has been more aggressive and now operates Zillow Offers in eight markets. Redfin has been more cautious, currently operating only in Orange County, San Diego, the Inland Empire region of Southern California, and most recently Dallas. “I can’t allow Opendoor or Zillow to go out and be the only player in the iBuyer space and then begin to dictate terms and build brand around ‘they buy houses,’” he said. Zillow’s earnings call with investors in February caused a bit of stir in the real estate world because it offered a startling glimpse into how an industry giant plans to remake itself, with the Zillow Offers program at the center of that transformation. Historically, the vast majority of Zillow’s revenue has come from selling advertising space to real estate agents through its Premiere Agents program; 67.5 percent of its 2018 revenue was in its Premiere Agents segment, but growth of that revenue has come to a sudden standstill. After years of double-digit year-over-year growth, Premiere Agent revenue is projected to grow just 2 percent in 2019. Zillow’s seemingly monumental shift in strategy comes as part of an industrywide trend of tech-driven real estate companies aligning their business models around solving pain points in the real estate transaction, whether that’s through launching new products or acquiring other companies. In addition to launching Zillow Offers, Zillow jumped into the mortgage business in November 2018 with the acquisition of Mortgage Lenders of America, adding another piece of the transaction to the company. Factor in its existing listings sites and Zillow is currently the closest to providing an end-to-end customer experience for real estate. Redfin, the discount brokerage that competes with Zillow, began quietly testing its homebuying program in early 2017 and has since launched and expanded it. In early 2017, Redfin also launched its mortgage division, Redfin Mortgage, and the company has long sold title insurance through its subsidiary Title Forward. Meanwhile, Opendoor has also made moves in the direction of becoming a one-stop shop. In August 2017, it launched mortgage and title insurance divisions, and a year later it acquired OpenListings, a listings site that TechCrunch says automates much of what a realtor does so you don’t have to pay for one. It also reportedly began co-listing some homes in Phoenix, Arizona, with traditional real estate agents, which puts Opendoor “squarely at parity with Zillow in terms of agent involvement and the value proposition for agents,” according to an analysis by DelPrete. As the lines start to blur between the Zillows and the Opendoors, each player will lean on competitive advantages rooted in its original business. For the latter, having been set up around iBuying gives them operational efficiencies that companies just jumping into the space don’t have, according to DelPrete. They’re in the most markets and could use their first-mover advantage to become synonymous with the instant-offers concept. For Zillow, which now operates Zillow Offers in eight markets, listings sites brought in more than seven billion visits in 2018, a huge portal through which it can market Zillow Offers. The Zillow Offers program can also feed its existing business of selling leads to real estate agents; if a home seller declines an Zillow Offer, it can sell the lead to traditional agents. And with $658 million in cash on hand at the end of 2018, Zillow also has the financial capacity to buy thousands of homes without having to raise investor funding like Opendoor and Offerpad do. But as more players jump into the space and markets are saturated with various competing platforms, profit margins that are already paper thin get squeezed even more. Zillow says it’s making $1,723 per home flip at a minuscule 0.6 percent profit, which leads one to wonder if this space is really worth getting into if you don’t have multiple modes of monetization. That’s where the concept of a one-stop shop for home buying and selling becomes especially attractive. If one company can seamlessly integrate each individual component of the real estate transaction—buying, renovating, insuring, and selling—and optimize operational efficiencies along the way, there’s a path to becoming the truly dominant real estate company.